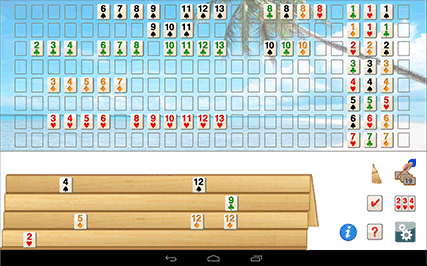 Romi lets you play Rummy Tile (RummyCube, Rummikub, Rami) games against the computer at three different levels. Romi is played with two sets of 52 cards and with two wild cards. The purpose of this game is to form groups of three or more cards, which contain either consecutive cards of the same suit or cards of the same number value but of differing suits. Dutch, Portuguese, Swedish and Norwegian.